This statement might disappoint or surprise people but having a website does not guarantee that you are going to end up in Google. Now, I know that maybe it does not seem like how it should be, but the thing is, if you build a website, firstly it does not suddenly end up in Google straight away. Now, there are various things that we do to make sure that the search engines to find our website. So we will usually announce it on our blog, so there is a link to it. Also, often you will find that when you are setting up your website, you end up adding yourself to some business directories, which is fine. That is what you would expect. However, the idea that you can build a website and suddenly you appear first for highly competitive keywords where there are thousands, maybe millions of other websites that are on those topics is well, that is not how it works. It is like okay, if you are going to do a letterbox drop and you are doing it in a part of the city which is already getting lots of letterbox drops every day, then it is harder to stand out. So maybe a better example is if you get fliers printed and then no one ever hands them out then no one is going to see them. So even though your website is on the internet does not necessarily mean that Google is going to rate it well. So if you search for welding companies in Sydney and there will be a certain number that will come up. However, if you searched modeling agencies, there’d be billions of them or something. There would be many pages that talk about all the different aspects of it. So I think maybe it is a little bit of a misconception that, just building a website is enough regarding the marketing budget as well because it is just one part of it. It is like if you got a TV ad made up, you do not necessarily… I mean, it does not end up on TV unless you pay for it to be broadcasted. Also, the same with the radio ad or letterbox drop or whatever it is. You need to do something with it after it is built to get people to pay attention to it. Now, there are a couple of the main ways that that can happen. 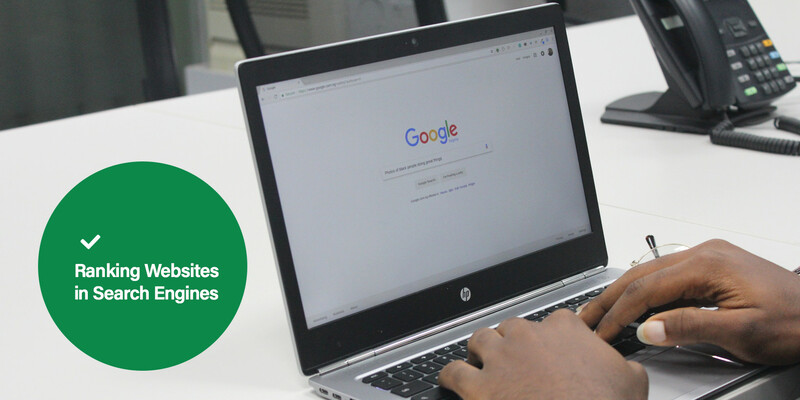 You can buy ads in Google on the Google AdWords system and pay anywhere from 50 cents to $50 per click, per person to get through to your website. Alternatively, you can build a fantastic website with lots of content, lots of original content, things that are not just copied and pasted from other sites. Also, you can then put some time into getting links on things like directories and forums and appear as a guest writer on a blog maybe, or you get to sponsor a sporting club and get a link on their website. There are lots of different ways that you can get a reference or a link back to your site and that more of those you have, the better. Oversimplifying a little bit here, but if you have plenty of information on your website and you can get some good references and links back to your site, then it should come up somewhere in the search results. You still don’t get to control exactly which keywords it comes up for or which place it comes up. Also, if you are expecting more precise results than that, then whether you are dealing with us for a website or have a dedicated search engine consultant, or however it is you are getting your site built, it will be a good idea to have the conversation about well, what do you want? What sort of keywords do you expect to come up? So then you can work out a budget for that. If you are trying to compete with the National Bank, ANZ, Commonwealth Bank or half a dozen other massive financial institutions and you want to appear on the homepage for home loans well, you got backlinks because you can not imagine how difficult it will be to outspend the advertising budget of one of these banks. I mean, they have revenues of billions of dollars. I am sure they put plenty of time and energy into their internet marketing so you have to be realistic about how you can approach this. Now there are still ways that you can stand out that the big organizations do not do as well. For example, you could set up a YouTube channel and start recording videos and putting them onto YouTube and build up your subscriber base there. You could start a podcast and get the podcast out, and the blogs written and get that into iTunes. You might find you get excellent coverage by building out a network on Facebook or spending time on message boards and groups in LinkedIn. Alternatively, you might find that if you can share great photos and images on Pinterest or another social photography type site, you get good traction there. I mean, if you want to take it back to real basics then you need to look at what sort of offline marketing you are doing, if you do business cards or not. So there are lots of ways of getting your website promoted but I just thought maybe it is not evident, but it is important to understand that a website does not equal a search engine ranking.